Lot's of people get a new haircut their freshman year of college. It could be because they want a fresh start. Or because World Religion 101 influenced them to become a Hara Krishna. Or perhaps because the thought of spending more than two minutes in a communal shower, especially after that skanky guy down the hall used it, makes them want to throw up. 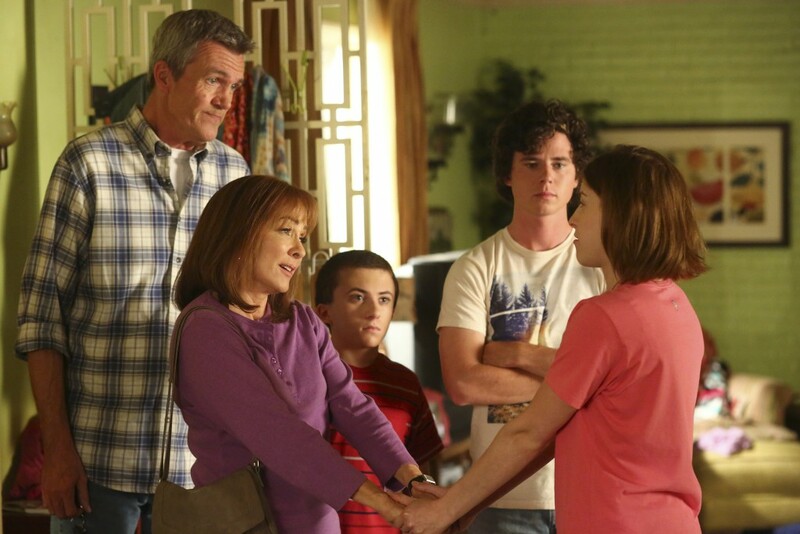 The Middle's Sue Heck, on the other hand, had a whole different reason. "She has a little curling iron mishap," says executive producer Eileen Heisler, "and it leaves her with a little bit of a new look for college." Despite burning her hair, Sue's spirits won't be dampened for too long. The freshman's bubbly personality will bounce back, and she won't be able to contain her excitement about moving out of the house and into her first college dorm. Take an exclusive first look at a few photos of Sue's shorter and sleeker bob here. Sue and mom Frankie have a heart-to-heart conversation. In the first episode of Season 7, the Hecks look forlorn about their car. Uh oh. Sue tries her darndest to resolve car troubles.